I don’t do resolutions; I set goals. I have several goals for Super Woman Productions and Publishing LLC. Some of those goals include being a brand that gives opportunities to aspiring authors to realize their dreams of becoming published. How can that be accomplished if I don’t have people on my team that believe that you, the people, deserve to know that my company exists? Another goal is for me to publish three books of my own this year. How can I accomplish that goal if I don’t have people on my team who want you, the people, to know that there are books being written and published? I want to be a household name, company and brand synonymous with publishing and eventually television and movie production. How can I ever reach that goal if I’m kept in a box built by someone else? I’m all for maintaining a level of privacy. I’m aware that I need to be careful about who I associate with, date, have relationships with, and whom I’m seen in public with. However, I’m realistic. I know that if I want to claim the crown as The Queen of All Media one day, I can’t do that if I’m a “secret”. I can’t assist others with becoming successful if I’m not reaching and achieving success myself because I’m being hindered. So I had to trim the fat from the team. I had to free myself from the box of secrets controlled by someone else, who for some reason felt that I was doing everything “wrong” and that I don’t understand media. Well, me doing things “wrong” resulted in me selling books, having my first book signing and having my first radio and magazine interviews. His doing things “right” didn’t accomplish anything; except possibly causing me to lose opportunities. At the end of the day, who did the better job? That’s rhetorical. We’re intelligent enough to know that selling books and gaining exposure and publicity trumps the “stop, wait and do nothing” method. Now that it’s 2011, I’ve set a business goal. I am open to business opportunities. I’m available for motivation speaking engagements in and out of state. I’m looking for investors who want to get into the entertainment industry in a way that will result in profits for them long term. I’m looking for authors who are serious about becoming published and have the talent to be more than a one-book-wonder. I’m available to plan your next major promotional or entertainment event. 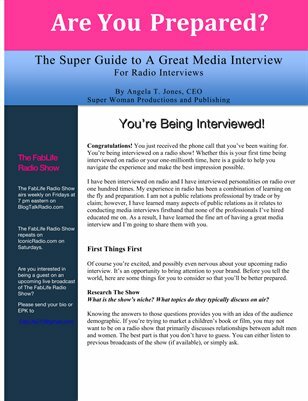 I will appear on your radio or television show. I will weigh all serious options and opportunities that come my way in 2011 that fit my business vision. I didn’t start this company for it to be held hostage by someone else’s inability to think outside the box. I started this company because I want to make a difference and I want to be successful. I appreciate you sharing your thoughts goals and the vulnerabilities that held you back. Bravo. Those are the things that most people, including myself, are aching to hear and learn to lose the fear to step out. Keep going. I’m trying to do some of those things with our young readers with United Voices of Literacy through the Readers are Leaders program in conjunction with the University of Southern California. Keep going girl you’re doing great.